Within its first three years, this bold venture, which has become the main London celebration of UNESCO's International Jazz Day, has grown from the small upstairs hall at the SGI centre in a Brixton side street, via Kings Place last year, to the octagonal Victorian splendour of Union Chapel. 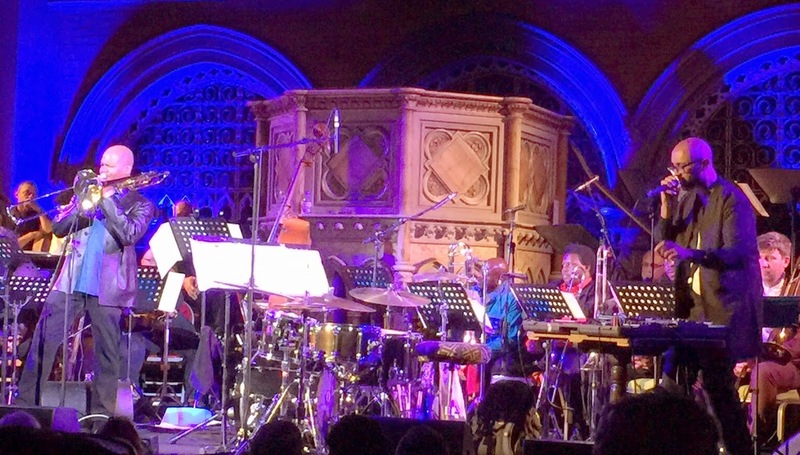 The size of Union Chapel did not overwhelm these protagonists at all, and there was no mistaking the energy and single-mindedness of all of those involved. Again and again the listener had the sense that a soloist wanted to rise to the big occasion, and produce a meaningful contribution to it. 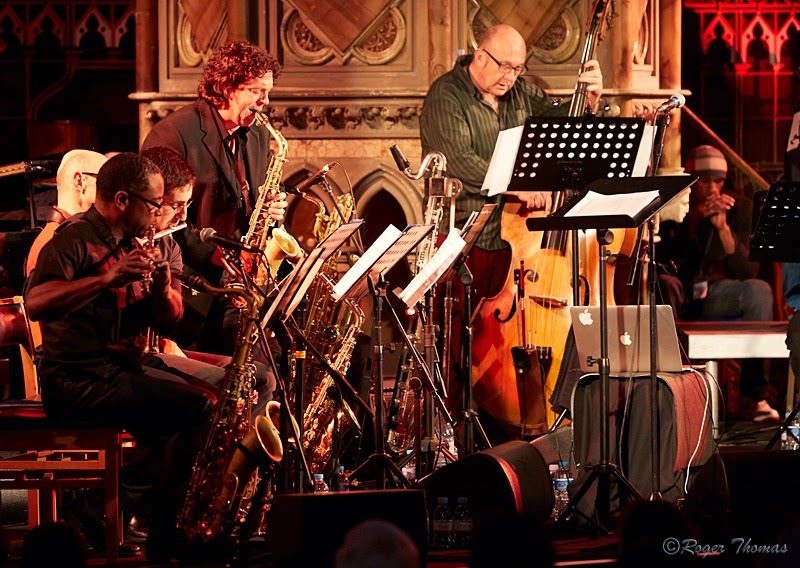 A top-class big band like this, glorying in its own sound, provides the launch-pad for soloists to want to bring their all. Alto saxophonist Christian Brewer (below) with an impassioned and fluent solo on Simon Purcell's Nadatar, Rod Youngs on drums towards the end of the same piece, Byron Wallen on Jason Yarde's high-energy Tall Call, guitarist Carl Orr on Blues for Jimi - they all made their big moments count, and they weren't alone. It was also an evening to enjoy varied and good quality wrting for big band. 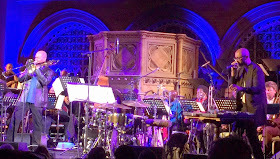 From the lopsided grooves of Yazz Ahmed's El Emadi to the intricacies of Nadiem Teimoori's Man of Two Visions, to the high-voltage energy of Jason Yarde's Tall Call, a consistent pleasure in this concert was the quality of composition and arrangement. The roster of guests also entered into the spirit. Robin Eubanks was at his most convincing when interacting with either Jason Singh or the band - his improvised duet at the start of the second set Singh, in which the vocal sculptor/beatboxer and trombonist sparred with each other was genuinely funny, each soloist in danger of creasing up the other with laughter. Sean Corby's spoken introductions and MC'ing were exemplary, and brought home clearly and emphatically the virtues, the importance and the unashamed idealism of this project, based on "music which expresses optimism in the face of adversity." This joyous and worthwhile venture deserves to prosper. Thank you so much for your post. "Jazz is not simply music.Jazz is about civil rights,human dignity and dialogue among cultures.Jazz emphasizes the importance of creativity and freedom of expression. "As UNESCO Director-General Irina Bokova added.Thanks again.